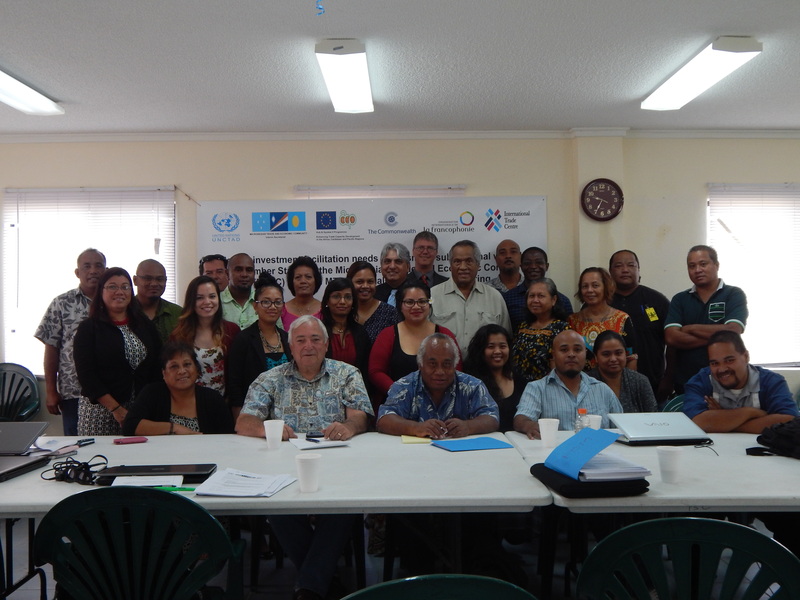 The Coastal Fisheries Governance Project team of the Pacific Community (SPC) visited the Federated States of Micronesia (FSM) and all its States from the 15 to 31 July 2018. The team was comprised of Ariella D’Andrea, Coastal Fisheries and Aquaculture Legal Adviser, and Jason Raubani, Coastal Fisheries and Aquaculture Management and Policy Specialist, accompanied by Valentin Martin, Deputy Assistant Secretary of the FSM Department of Resource & Development (R&D). 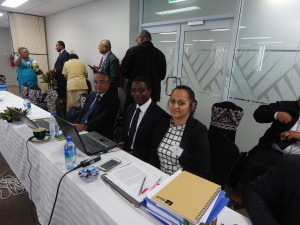 The purpose of the mission was to scope out information on challenges in coastal fisheries and aquaculture law and policy in FSM and to see where and how the project could assist in providing technical assistance in areas of need to FSM and its States. This mission was organised in response to a formal request made by the FSM National Government at the First Regional Technical Meeting for Coastal Fisheries held at the SPC Headquarters in Noumea, from 28th November to 1st December 2017. The request was based on the preliminary recommendations of the Pacific Islands Regional Oceanscape Program (PROP) Project, now published in the Coastal Fisheries Situation Analysis Report, February 2018. The team visited all four States, namely Pohnpei, Kosrae, Chuuk and Yap, and spoke to national and State agencies, including non-governmental organizations (NGOs), fish-market owners, fishers and tourism operators who have some role to play in coastal fisheries and aquaculture management and development. At the national level, the team met with about six national agencies and spoke to about 12 people. At the State level, the team met with about 18 State agencies and spoke to over 60 individuals. The findings indicated that the main governance challenge faced in coastal fisheries and aquaculture in FSM include legislative, institutional and policy barriers, limited financial and human resources, and capacity building needs. In addition, there is a pressing need to develop alternative livelihood activities to support food security and sustainable coastal fisheries management. The key legislative challenges for coastal fisheries and aquaculture management include lack of regulations for the implementation of the main acts, access to legal texts in force (e.g. it is difficult for officers to find the most recent version of all the laws relevant to coastal fisheries and aquaculture) and weak enforcement. From an institutional point of view, there are two main challenges. The first relates to the number of government agencies with overlapping mandates and responsibilities in coastal fisheries management, as defined in their respective legislation. The second institutional challenge is that in FSM, coastal fisheries management is carried out at national, state and local/ municipal government levels, as well as at community level. Having four different levels of governance adds significant complexity and requires strong coordination. The main policy challenge is that there are no specific overall national or state policy on coastal fisheries and aquaculture. Financial constraints, especially at the state and local government level, are a huge challenge. Moreover, there is a need to build capacity on the development of fisheries policies and management plans and on monitoring, control and surveillance (MCS), specifically on compliance and enforcement approaches, evidence collection and court case preparation. Based on the above challenges, SPC will work in close collaboration with FSM to design appropriate interventions with the support of the Governance Project. Preliminary actions that have been agreed include training on fisheries policy and management plans and on MCS. In one or two states, SPC will offer technical assistance with community management plans, regulations and municipal ordinances. The SPC Coastal Fisheries Governance project is a five-year project funded by the New Zealand Ministry of Foreign Affairs and Trade. The project started in late 2016 with three personnel employed for its implementation – a Coastal Fisheries and Aquaculture Legal Advisor, Coastal Fisheries and Aquaculture Monitoring, Control and Surveillance Specialist and a Coastal Fisheries and Aquaculture Management and Policy Specialist. The main goal of the project is to enhance food security and sustainable livelihoods from fisheries and aquaculture through six outputs that include: development of national and sub-national laws and regulations; development of policies and management plans; capacity development, training and mentoring to national and sub-national level officers; MCS training; and awareness raising on fisheries rules and regulations. The above is a summary of a three weeks visit and if you would like further information about the findings or the project, please do not hesitate to get in touch with Ariella on email ariellad@spc.int, Jason on email jasonr@spc.int or Valentin Martin on email fsmmrd@mail.fm . For more information, please see FSM Statistics website. The Division of Trade and Investment, FSM Department of Resources and Development recently conducted Phase I of the review and update of the FSM 2011 National Trade Policy, which identifies a set of recommendations to promote and facilitate private sector development and foreign direct investment in priority sectors in order to achieve export-led economic growth and sustainable development, creating employment, improving services, alleviating poverty with the ultimate objective of raising the standards of living in the FSM. Consultations with National Government agencies took place in Palikir on April 10-11, 2017, and were attended by Secretaries and Officials from FSM Department of Health and Social Affairs, Education, Customs and Tax Administration, Foreign Affairs, OEEM, Agriculture, NORMA, Banking Board, and Agriculture. Consultations with state stakeholders took place in Pohnpei on April 12-13, Chuuk on April 19-21, and Yap on April 24-25, 2017. During State consultations, the Trade Policy Review Team met with the Honorable Reed Oliver, Lt Governor, State of Pohnpei; Hon. Johnson Elimo, Governor, State of Chuuk; Hon. Tony Ganngiyan, Governor of Yap State and Hon. James Yangtemai, Lt Governor of Yap, government officials, private sector representatives, farmers groups and associations, and non-civil organizations. The trade policy review team was comprised of Mr. Florian Yatilman, Assistant Secretary, Division of Trade and Investment; Mr. Herman Semes, Business Development Adviser, and Mr. Jean Bertrand Azapmo, National Trade Advisor under the Hub & Spokes II Programme funded by the European Union, the ACP Secretariat, the Commonwealth Secretariat, and l’Organisation Internationale de la Francophonie, APTA Secretariat, and the Pacific Islands Forum Secretariat. Secretary Marion Henry and Mr. Bermance Aldis, Tourism Program Manager, joined the consultations in Chuuk State, where they discussed the implementation of projects identified in Chuuk State Tourism Investment Plan. In each States, the Trade Policy Review Team began with a discussion on stakeholders awareness of the FSM trade policy, followed by an evaluation of activities, programs, and initiatives undertaken as well as legislation put in place by State and National Governments between 2012 and 2016, with a view to achieve the Trade Policy objective of promoting and facilitating private sector development and foreign direct investment in priority sectors in order to achieve export-led economic growth and sustainable development. Finally, the review also covered the functioning of National and State Trade Facilitation Committees established to oversee and coordinate the implementation of the Trade Policy. The preliminary findings suggest limited awareness of the trade policy, limited capacity to implement trade policy recommendations, and ineffective State Trade Facilitation Committees. Consultations in Kosrae are scheduled for June 2017. In the margins of the Trade Policy Review, the Team also held discussions with stakeholders on recommendations to strengthen the SBDC network in the FSM, elements of the proposed Economic Roadmap, and the proposed FSM Start’n Grow, a financing scheme to support private sector development in priority areas identified under the Strategic Development Plan and the proposed Economic Roadmap. For further clarification on any of the above, please contact Mr. Florian Yatilman, Assistant Secretary, Division of Trade and Investment, FSM Department of Resources and Development on Tel.3205133, email florian.yatilman@gmail.com. 1. The Tenth SNLC officially opened on Saturday morning, March 18, 2017 at the Rose Mackwelung Public Library, Tofol, Kosrae, under the Chairmanship of the Honorable Lyndon H. Jackson, Governor, State of Kosrae, following an opening prayer delivered by Reverend Takeo Likiaksa, who drew inspiration from the Bible, Book of Proverbs, Chapter 16, Verse 3 “commit to the Lord whatever you do and your plans will succeed”. 2. During the two-day conference, the SNLC Principals discussed critical issues for the economic and social development of the FSM including: national security priorities; international ship and port security measures; health issues focusing on non-communicable disease trends, health sector human resource capacity development, off-island referrals and manpower issues, and medical insurance under MiCare; World Bank fiber-optic cable projects; and revisiting of the tax reform. 3. The 10th SNLC also received updates on progress in the establishment of PMOs at the State level and the latest development in the implementation of Compact funded infrastructure projects. In addition, Pohnpei and Chuuk States presented on the topics of local revenue sharing between the National and State Government, financial needs of State Governments, and selection and implementation of development Projects throughout the Nation. 002 – To Endorse the Establishment of a Diagnostic Health Facility as Remedy to a Referral System, and Support Health Man-Power Development Programs, National Legislative Measures and an Effective Non-Communicable Diseases (NCDs) Monitoring and Surveillance System. 003 – In support of the FSM’s World Bank funded ICT Projects and immediate action to meet the project disbursement conditions. 004 – To urge the National Government to develop alternative options to reform the tax system of the Federated States of Micronesia. 005 – Reaffirming the mandate for all Governments to collaborate on available financial resources in light of unmet needs. 006- To urge the National Government through its appropriate departments and agencies to regularly invite input and recommendations from the state counterparts to ensure that the State and National priorities are clearly aligned for the betterment of our nation. 007 – To request that the State and National Leadership of the Federated States of Micronesia establish and adopt a tracking system on all issues, discussions and recommendations at the conclusion of the Conference Agenda for reference and update in future State and National Leadership Conferences. 5. Mr. Redley Killion, President of the FSMACC addressed the 10th SNLC, focusing on areas where swift actions are required from the State and National Governments to improve and grow the FSM economy with a view to generate the needed revenue, including FSM Development Bank and commercial banks’ high interest rates; infrastructure Development Fund for capital equity for local businesses; completion of land survey and titling; general lack of skill manpower development, in particular the need to speed up the implementation of 9th SNLC Resolution 001 to Endorse the Establishment of a National Career and Technical Education School; cost of fuel and utilities; current tax structure; and high cost and poor communication services. Finally, Mr. Killion indicated the FSMACC’s support for the proposal to centralize foreign investment permit processes at the national level and the need to ensure that measures are put in place to enhance local business development and protect small businesses. 6. During the 10th SNLC, Mr. Fredy S. Perman, Vice-President and COO of FSM Telecom (FSMTC), informed the 10th SNLC that beginning May 1, 2017, the rate for interstate mobile calls will be same as intrastate mobile calls. 7. 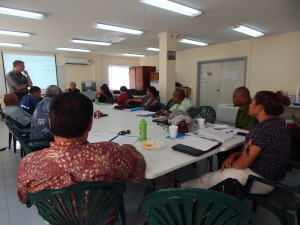 Under miscellaneous, the Principals, discussed progress towards the establishment of an Office of Veterans Affairs, implementation of the Convention on the Rights of Persons with Disabilities following its ratification by Congress, uniformed/harmonization of minimum wage, Public sector reform, and hosting of the 2018 Micro Games by the State of Yap. 8. The 10th SNLC was attended Hon. Yosiwo P. George, Vice-President of the FSM; Hon. Wesley Simina, Speaker of the 19th FSM Congress; Hon. Lyndon H. Jackson, Governor, State of Kosrae; Hon. Tulensa Palik, Speaker, Kosrae State 11th Legislature Hon. Johnson Elimo, Governor, State of Chuuk; Hon. Reed B. Oliver, Lt Governor, State of Pohnpei; Hon. Fernado Scaliem, Speaker, Pohnpei State 9th Legislature; Hon. Theodore Rutun, Speaker, Yap State 9th Legislature; and Mr. Francis Itimai, Director, Department of Youth and Civic Affairs, Yap State, Representative of Hon. Anthony Ganngiyan, Governor, State of Yap. 9. The Conference was also attended by Honorable Members of the FSM Congress and Senators of State Legislatures; Ms. Joanne Cummings, Deputy Chief of Mission, Embassy of the United States of America to the FSM and Captain Jim Pruett, Commanding Officer, US Coast Guard, Guam Sector; Cabinet Members of the FSM National and State Governments; Members of the Private Sector led by Mr. Redley Killion, President of the FSM Association of Chambers of Commerce (FSMACC); and Kosrae Municipal and Church Leaders. The Communiqué and Resolutions were signed by the five Heads of Delegations for the 10th FSM SNLC which concluded the Conference on March 20, 2017. For details, please contact the SNLC Secretariat, Department of Resources and Development, by email: fsmrd@fsmrd.fm or telephone: +691 320-2620/2646/5133. In the week of 20-24 February 2017, 13 employees from the national government participated in the Data Communications and Infographics Basics Workshop at the Central Facility at the government complex in Palikir. The participants represented the Department of Education, Department of Justice, Department of Resources and Development, and NORMA. The objective of the workshop was to teach participants how to turn complex information and data into infographics (pictorial presentation of the data) for a wider dissemination, with a primary focus on Household Income and Expenditure (HIES) based statistics. The training targeted data producers or providers and was specifically designed for National Statistical Offices communicators. During the workshop, the participants learned: how to think about data and the visual communication of data; how to conceptualize an infographic that reinforces their message; and how to make their inforgraphic-design easily understood by a wider audience. “The whole point of the exercise really is to enable robust ‘evidence-based’ decision making or policy formulation. When information is presented in an easy to understand manner, and infographics do that in a dynamic way, it has higher chance of being utilized in high-level decision making processes, and thus to improving our citizens’ lives”, said the Assistant Secretary for Statistics, Ms. Brihmer Johnson. 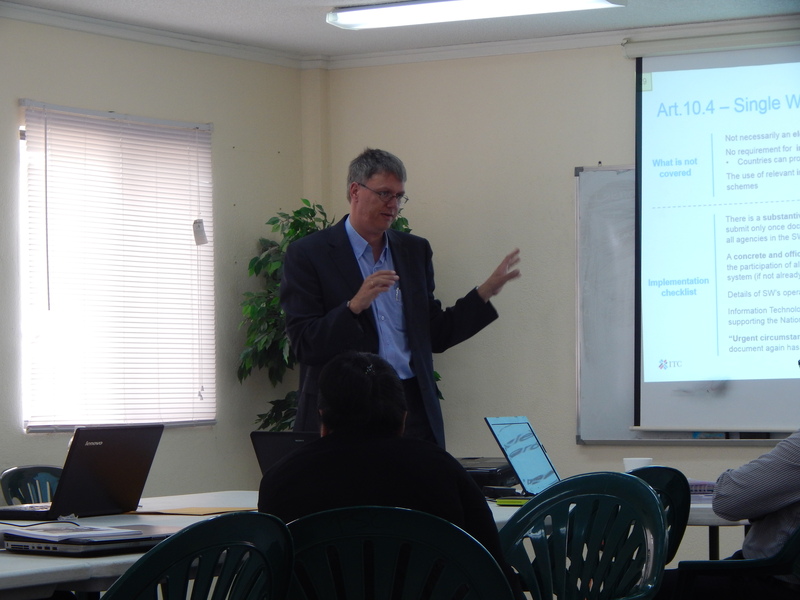 The workshop was organized by the Statistics for Development Division (SDD) of the Pacific Community (SPC) in Noumea and the Statistics Division of the Department of Resources and Development (DRD). It was a follow-up to the HIES Data Analysis Workshop conducted in September last year, at which time the participants learned basic data analysis skills, brainstormed on concepts for infographics to convey key messaged relevant to their program areas. This workshop provided the participants the opportunity to transform these ideas into infographics, with the guidance of Infographics Expert, Ms. Gaelle Le Galle. Mr. David Syne, IT Manager from the Education Department said “infographics is very interesting and relevant to my work. I’m excited to begin using this tool and sharing the education ‘story’. It would get the message across easily, and in an eye-pleasing manner too”. By the end of the workshop the participants were able to produce 20 posters. The final versions will be availed to the public upon completion of data checks and validation process. To view a sample poster click here. For further information, please contact the Division of Statistics, Department of Resources & Development at (691) 320 2646/5133/2620 or email: fsmrd@fsmrd.fm. The ESMF framework provides principles and guidelines which are consistent with laws of the Pacific Island Countries that are involved in energy projects and is also relevant to the World Bank Safeguard Policies. For more information on ESMF please refer to the document under the Energy section. Simply click on home and you can find Energy on the first Menu. The 7th Ministers’ Meeting of the Micronesian Trade and Economic Community (MTEC) discussed trade and investment facilitation and harmonization of labor and immigration legislations between the FSM, RMI, and Palau. 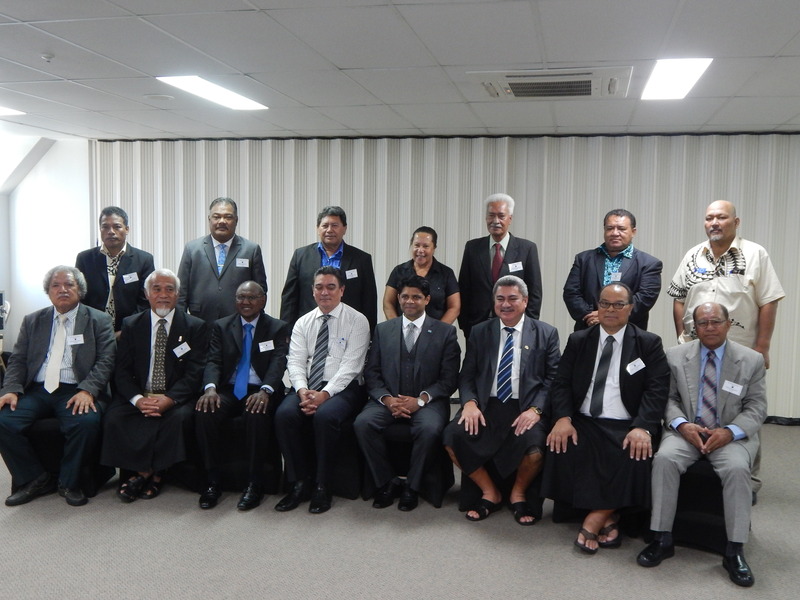 The 7th Trade Ministers’ Meeting was held on 13 July, 2015 at the PSC Conference Centre in Majuro, RMI. The Meeting was attended by the Honorable Marion Henry, Secretary, Development of Resources and Development (Federated States of Micronesia (FSM)), the Honorable Michael Konelios, Minister of Resources and Development, RMI, and the Honorable F.Umiich Sengebau, Minister of Natural Resources, Environment and Tourism, Republic of Palau (Palau). 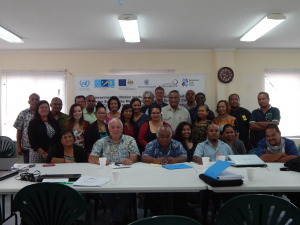 The objective of the meeting was to discuss the recent developments in intra-regional trade and investment in the Micronesian sub-region, the MTEC trade and investment facilitation roadmap, harmonization of labour and immigration laws between MTEC members, ongoing negotiations involving MTEC Member States, and finally the conduct of the MTEC Interim Secretariat’s affairs. In this opening statement, the Honorable Michael Konelios, Minister of Resources and Development, RMI, underscored the importance of the 7th MTEC Ministers’ Meeting in moving forward the broader issues of interest to MTEC Member States. 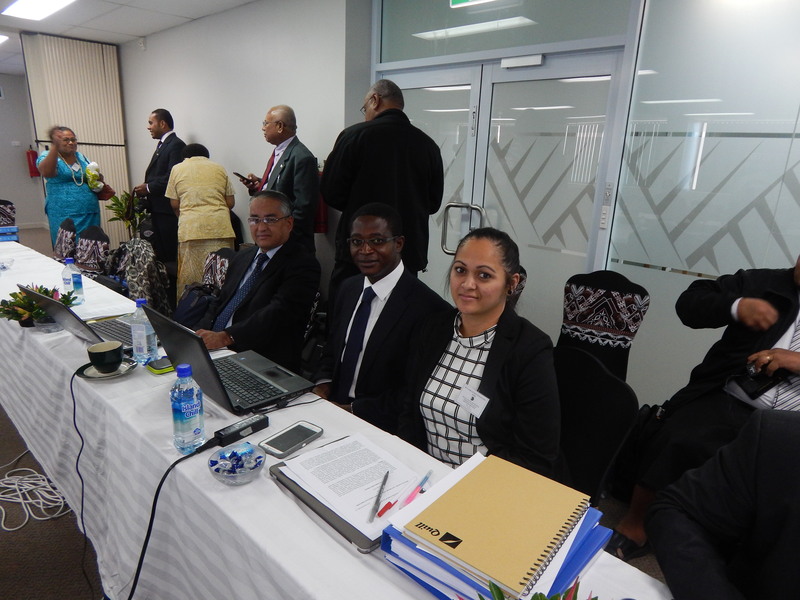 He informed the Meeting that RMI ratified the MTEC Treaty in February 2015, thus becoming the first country to complete the ratification process and highlighted two areas of “early harvest” which should be given priority by the Member States: harmonization of labor and immigration laws to ease the movement of people and workers within the sub-region and the removal of non-tariff barriers through the implementation of trade facilitation measures. The Honorable Marion Henry reaffirmed FSM’s support towards advancing sub-region integration as substantiated by the institutional support currently provided to the MTEC Interim Secretariat by the FSM Government through the Department of Resources and Development. He reiterated the importance of trade and investment facilitation measures and the harmonization of labor and immigration laws as initial steps towards the sub-regional integration. The Honorable Sengebau informed the Meeting that a draft resolution on the ratification has been submitted to the Parliament and reaffirmed Palau’s commitment to support the operations of the MTEC Interim Secretariat. With respect to trade and investment facilitation measures, the 7th MTEC Ministers’ Meeting noted the preliminary findings of the trade and investment facilitation needs assessment Workshop and endorsed the MTEC Trade and Investment Facilitation roadmap held on July 7-9, 2015, and directed the MTEC Interim Secretariat, in collaboration with Member States, to mobilize resources available from relevant technical agencies such as ITC, UNCTAD, and the Commonwealth Secretariat, as well as traditional and non-traditional development partners to implement the MTEC Trade and Investment Facilitation Roadmap. In addition, MTEC Ministers discussed and agreed among other things to start right away, the creation of a database of private sector doing business in the region for dissemination. With respect to harmonization of labor and immigration laws between the FSM, RMI, and Palau, MTEC Ministers noted that presently nationals from the FSM and Palau are granted visa-free entry into the RMI for an unlimited period of time and do not require a permit to work in the RMI; and that these benefits were not reciprocated to RMI citizens. The 7th MTEC Ministers recalled that the issue was already discussed during the 12th Micronesian Presidents’ Summit and that action was needed. The issue will be reviewed with Ministers and Officials responsible for Labor and Immigration at the next MTEC Meeting to discuss progress made. 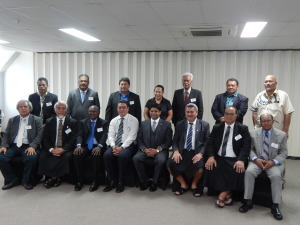 The 7th MTEC Ministers’ Meeting also considered updates in ongoing trade negotiations involving the FSM, RMI, and Palau, in particular the negotiations for the Pacific Agreement on Closer Economic Relations (PACER) Plus negotiations between Forum Island Countries and Australia and New Zealand and the negotiations for the Economic Partnership Agreement (EPA) between Pacific Countries and the European Union. Finally, MTEC Ministers agreed to mobilize annual voluntary financial contributions to support the implementation of the MTEC 2015-2019 Work Program to achieve the objectives and goals of the MTEC. The FSM, RMI, and Palau complete their preliminary trade and investment facilitation needs assessment with the technical assistance of the Commonwealth Secretariat Hub & Spokes II Programme teamed up with the International Trade Centre (ITC), the United Nations Conference on Trade and Development (UNCTAD), and the Economic and Social Commission for Asia and the Pacific (ESCAP) during a sub-regional workshop on July 7-9, 2015. The Sub-regional Workshop on Trade and Investment Facilitation needs assessment for Member States of the Micronesian Trade and Economic Community (MTEC), which took place on July 7-9, 2015, at the Public Service Commission Conference Room, in Majuro, Republic of the Marshall Islands (RMI), was convened by the MTEC Interim Secretariat currently headed by the FSM Department of Resources and Development. The Workshop brought together 37 Senior Government Officials, Port Authorities, and Private Sector representatives from the FSM, RMI, and Palau, as well as a representative from the Micronesian Shipping Commission (MSC). 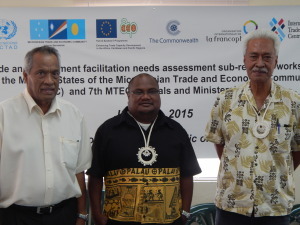 This very important activity, identified in by the FSM, RMI, and the Republic of Palau in the 2015-2019 MTEC Work Program, was facilitated by the Commonwealth Secretariat Hub & Spokes II Programme, the International Trade Centre (ITC), the United Nations Conference on Trade and Development (UNCTAD), and the United Nations Economic and Social Commission for Asia and the Pacific (ESCAP). The Workshop contributed to strengthen participants’ capacity in trade and investment facilitation, shipping connectivity, and cross border paperless trade through presentations delivered by Dr. Saeed, Chef Trade Facilitation Section, ITC, Dr. Hoffman, Chief, Trade Facilitation Section, UNCTAD, Dr. Yann Duval, Chief Trade Facilitation, Trade and Investment Division, and Mr. Sangwon Lim, Economic Affairs Officer, Trade Facilitation Unit, Trade and Investment Division, ESCAP, and Mr. Azapmo National Trade Adviser, FSM Department of Resources and Development. The needs assessment exercise was conducted and facilitated by Dr. Saeed and Dr. Hoffman, whilst the categorization and roadmap were prepared by Mr. Azapmo. The preliminary findings indicated that there were 10 Category B measures common to the FSM, RMI, and Palau which were partially implemented and thus required improvements. In addition, the findings revealed that the FSM, RMI, and Palau were non compliant with respect to four Category C measures: creation of enquiry points, establishment of trade facilitation for authorized operators, movements of goods intended for import under custom control, and creation of a single window. Frank exchanges of information, discussions, and interactive group work sessions involving private sector representatives and government officials attending the Workshop contributed to enhance Public-Private Sector dialogue on the various topics. This led to the designation of champions among private sector representatives and government officials to lead the implementation of priority activities identified in the Trade and Investment Facilitation Roadmap developed by participants. The Roadmap was adopted by MTEC Ministers during their 7th Meeting on July 13, 2015 and subsequently endorsed by the 15th Micronesian Presidents’ Summit on July 15, 2015. Although the FSM, RMI, and Palau are not yet WTO Members, they see the importance of trade and investment facilitation which will contribute toward enhancing trade and investment flows between the three Countries, thus increasing regional integration and fostering their integration into the world economy. The MTEC was established in 2014 through a Treaty, which envisions the creation of a community of shared prosperity through the promotion of sub-regional trade and economic cooperation and integration to support the achievement of sustainable and equitable socio-economic development of its Member States, and facilitate their integration into the global economy. The fruitful collaboration between the MTEC Interim Secretariat, Commonwealth Secretariat Hub & Spokes II Programme and ITC, which led to the successful conduct of this Workshop, is expected to strengthen during the implementation of the priority activities identified in the MTEC trade and investment facilitation Roadmap, which was adopted by MTEC Ministers during their 7th Meeting on July 13, 2015 and subsequently endorsed by the 15th Micronesian President Summit on July 15, 2015 in Majuro. The next immediate step will be to organize national consultations to validate the findings of the preliminary assessment undertaken during the Workshop. After one year of national and state consultations, the Division of Trade and Investment has recently completed the publication of the 2015 FSM Investment Guide, a promotion and marketing document that aims at providing useful information on investing in the FSM and guiding any potential local or foreign investor in setting up a business in the FSM. The Investment Guide was designed and printed in Guam and delivered to the FSM Consulate General in Guam on May 27, 2015. In the welcome message, Secretary Marion Henry of the FSM Department of R&D highlighted the distinctive features of the 2015 edition of the FSM Investment Guide, which comes nearly 10 years after the last investment guide was published. In effect, unlike the 2006 edition, the 2015 FSM Investment Guide goes beyond the traditional sections on basic information about the FSM and the business enabling environment by providing updated detailed information on the main investment opportunities in the FSM, including tuna processing; fishing vessels and fishing nets repair and maintenance; tourism development around historic and archaeologic sites; protected areas and water-based sport activities; production of poultry products and drinking water; production of exotic agriculture products and small scale agro-processing; international transportation; and production of renewable energy, to name just a few. In addition, the guide offers a snapshot of fiscal and non-fiscal incentives available to investors, all the relevant information on starting a business in the FSM, with detailed information on the steps and competent agencies, and a list of useful addresses to make the entire process business friendly than ever.